As we are already at the end of February – how tempus fugit, it seems a good time to showcase the new 2018 bespoke desktop calendar design we recently created for TAG Farnborough Airport. 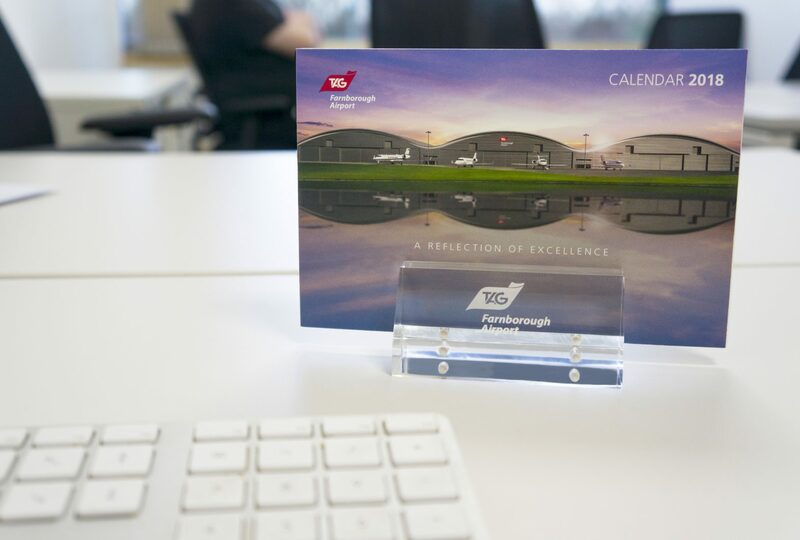 We have designed bespoke calendars for TAG Farnborough Airport for a number of years, always seeking to provide a ‘desktop metaphor’ – a functional reminder of the benefits of using the unique purpose-built business-only airport. Showcasing the architecture, facilities and services – and always seeking to reflect the quality of the user experience available for business aviation owners, operators, passengers and employees at TAG Farnborough Airport. 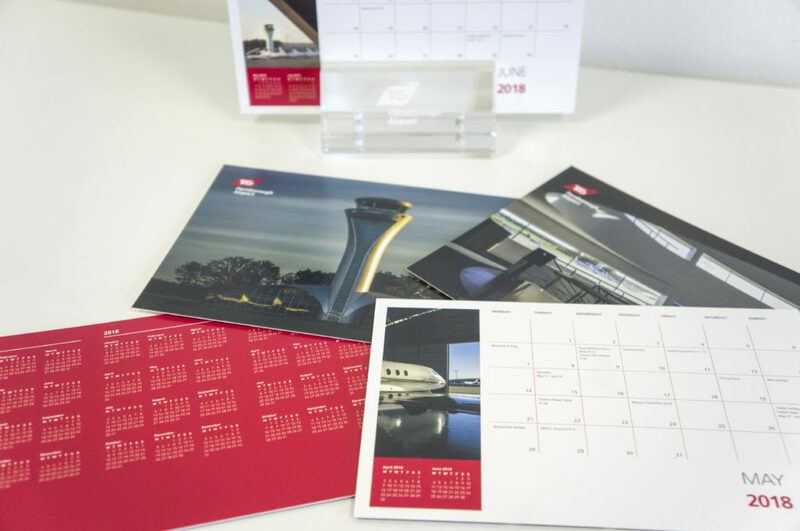 The 2018 bespoke desktop calendar uses a specially made TAG Farnborough Airport branded two-part clear acrylic base with magnetic fastenings that act as a clamp and contain the 14 loose leaves of the landscape format calendar. In addition to the cover which is based on our current advertising campaign for the airport ‘Reflecting on excellence’ and the back sheet which lists an at-a-glance 2019 calendar the 12 month-to-view date pages each pictures one of the main facilities or services of TAG Farnborough Airport. The brief always requires that whilst needing to be aesthetically pleasing, the functional practicality of the desktop calendar is maintained. The date pages feature international days of significance to the business jet traveller and have to be able to be written on with a pen. The calendars were delivered to customers in the UK and beyond in special padded packaging sealed with a seasonal greeting band.